Hunky dory is a slang term used to describe a situation, event, or condition as just right and good. It is a sunny, happy expression, mostly applied to everyday happenings. According to an extremely casual survey I conducted among friends and family, it seems a lot of people still know what it means – the expression describes a situation that is highly satisfactory and satisfying at the same time – but you don’t hear it much anymore in daily conversations. My mother would use “hunky dory” all the time, for example to indicate the positive state of our family’s vacation plans, my progress in learning fractions, or to reassure a waitress that the food and service was just fine. She might have also used the words “copasetic” or “jake” to do the same, but a discussion of those terms, dear reader, is for another blog entry. Besides sounding dopily funny and friendly, the back story for this expression is interesting because it is like a mystery that has never been solved, whereas word sleuths are usually confident they can nail down the origins of anything that has consonants and vowels in it. There seems to a consensus that the “hunky” part of the phrase goes all the way back to the early settlers in New Amsterdam, which was later renamed New York and was derived from the Dutch word “honk” which meant “home” or “goal” in regards to a game similar to tag. (Think “home run” or “home plate.”) By the mid-19th century the word had evolved into “hunk” and was used to refer to a state of being safe and sound, and then, further gained the meaning of something being excellent and in order. But where did the “dory” part of the phrase come from? 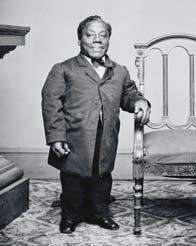 Enter Japanese Tommy, a less-than-36-inches-in-height highly regarded singer, dancer, and violinist, and despite his name, the only African American performer in an otherwise all blackface minstrel show in Civil War era Manhattan. While Mr. Dilward never came close to being in or of Japan, he may have heard what could have been American sailor slang that combines “hunky” (a state of material and physical well-being) with “dori (the Japanese word for “street”) to allude to the part of a Japanese town where all things pleasurable could be found. Hmm. There’s a lot of speculation in that explanation, and not too many facts, but any story that contains the name Japanese Tommy has got me, right from the start. This entry was posted on Wednesday, July 18th, 2012 at 2:35 pmand is filed under . You can follow any responses to this entry through the RSS 2.0 feed. You can leave a response, or trackback from your own site.